Sshhhh! 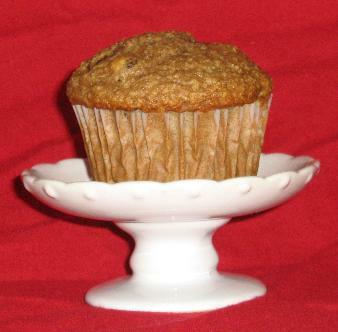 This is a top-secret sneak preview of a little something I whipped up for Mother’s Day, so think of this as an advance screening. 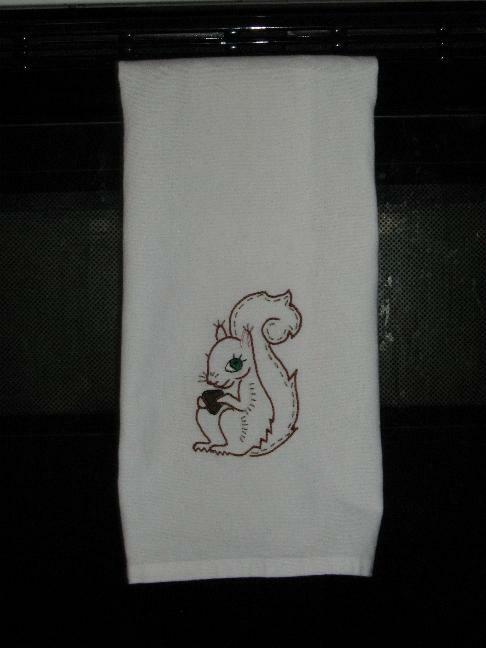 You may recall that a couple of years ago I embroidered a Swedish Chef towel for my mother’s birthday. 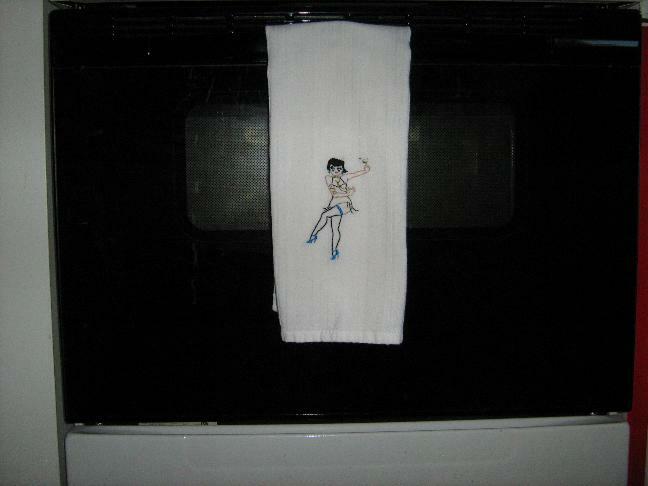 He still gets a lot of use, but it’s seemed to me that he could use a companion towel – most of our other tea towels come in pairs, except for the poor, lonely Chef. 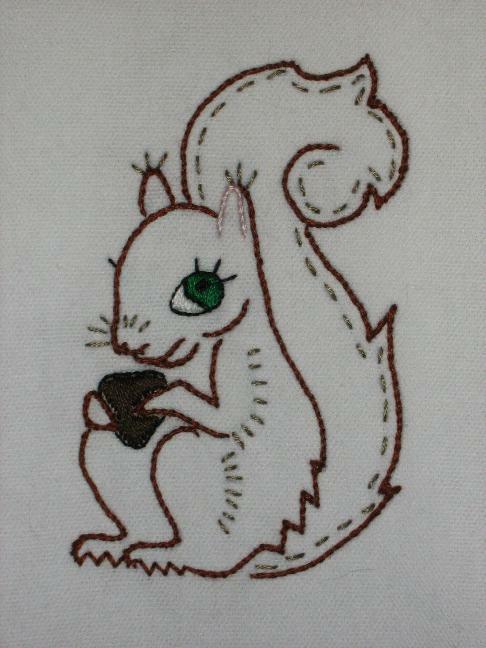 So, bork-bork-bork, I decided to embroider the squirrel design from Sublime Stitching’s Forest Friends pack. At this point, you’re probably questioning the connection. Why not another Muppet, or something more kitchen-y? Well, it all started like this: the very first episode of The Muppet Show that I remember seeing was the one guest-starring John Denver, with a camping theme. In this one, the Swedish Chef has traded his kitchen for a little set-up in the woods, and has decided to make squirrel stew. I can’t do it justice; just watch the video. Here it is, posing on the oven door. A better view of the stitching. It’s done mostly in stem stitch with the little tufty fur bits in backstitch, and a hint of satin stitch to keep it interesting. I love my wife, but oh, you kid! So, over the winter I took a Swing Dancercise class through the city’s leisure guide…basically, an hour of aerobics with swing-based footwork and a little choreography thrown in for fun. I won’t be winning any dance contests anytime soon with what I’ve learned, since this was a no-partner-required deal, but hey, it got me off the couch for an hour a week. The instructor made it really fun, too, always kept things upbeat. It’s mostly backstitch, with a little satin stitch and a few French knots thrown in for good measure. Her dress and gold accessories were done in Petite Treasure Braid metallics, which are honestly the best metallic threads I’ve ever used. Pricey, but worth it. And her garter matches her shoes….eeee!! I took a break from my many U.F.O.s (on which more at some later date, assuming I actually manage to finish one) to work up a couple of onesies for a girl in my bowling league who is very, very pregnant – due April 22, our last night of the season. 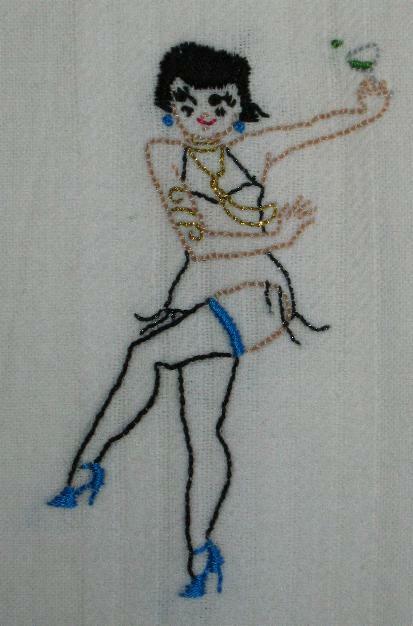 What else but Sublime Stitching’s Bowling Betties pattern sheet would fit the bill? And since I managed not to screw that one up, and had a spare one (get it? Spare?) left over, I found a cute kitten pattern from the Sublime Stitching book, and made it as gender-neutral as possible. Oh, but back to the subject at hand: I presented them to her on Wednesday, in case she decided to pop early, and she loved them! 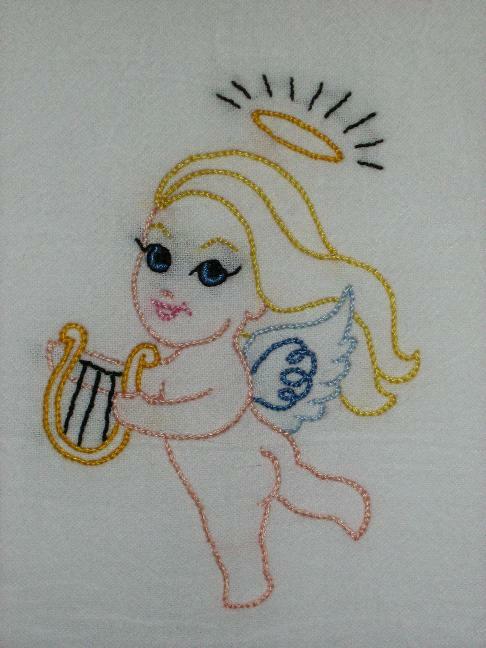 Her teammates were cooing over them, and they couldn’t believe I had done the embroidery by hand. I love it when a few stitches can wow an audience. I do apologize for the long-time-no-posts….I’m going to blame work for this one, but I’m hoping to be posting a lot more soon, what with the holidays rapidly approaching. At any rate, on with the crafty goodness, yes? I had purchased the Lisa Petrucci designs from www.sublimestitching.com some time ago, though I hadn’t yet committed them to fabric. 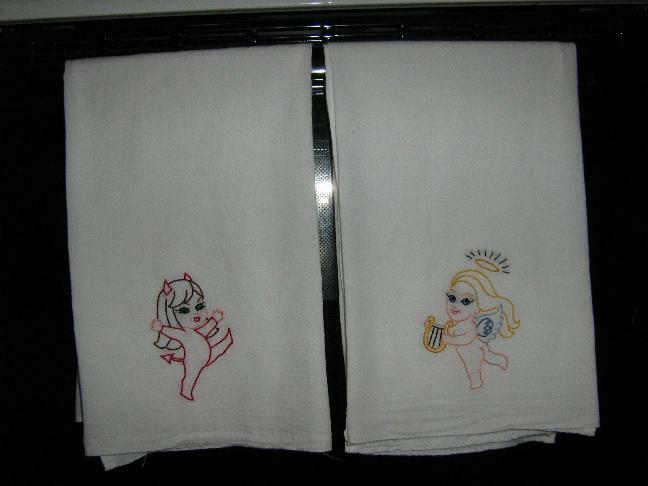 Then my friend Dan got her own place, and decided to go and have a birthday shortly thereafter (inasmuch as one’s birthday can be determined by free will, of course :P), and somehow, a set of hand-embroidered tea towels seemed like the perfect housewarming/b-day pressie. Especially when they’re this cool. 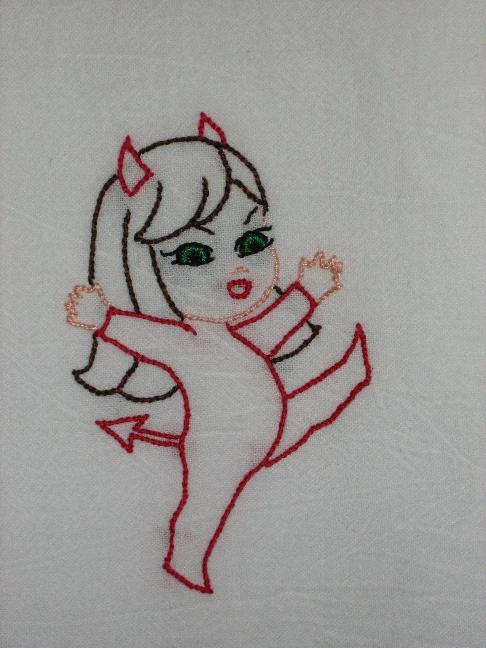 I particularly like the devil – clearly, being bad is more fun than being good! And now, of course, I want to do the devil again…for myself!